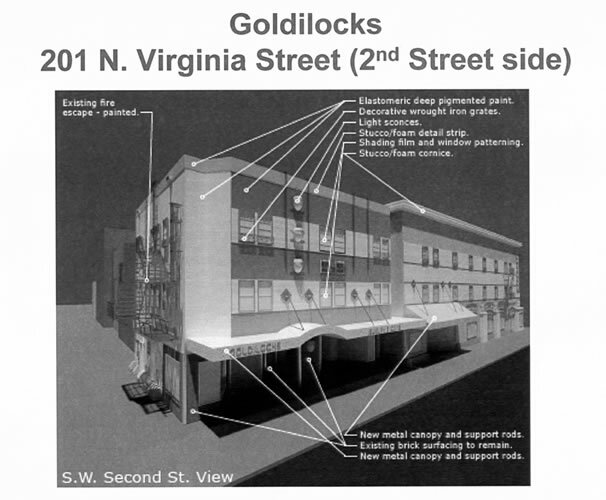 The Facade Improvement Program was a valiant effort by the City Council to attempt to reskin the most visibly disturbing strip of Virginia Street between 2nd and Commercial Row. 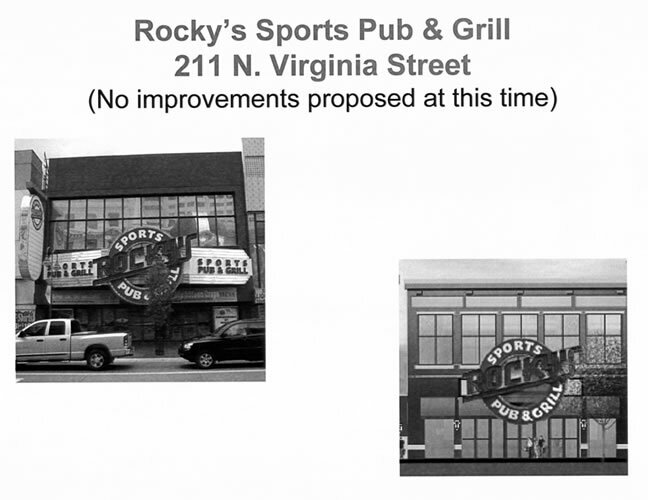 This was prior to Knitting Factory, Siri's Casino, and Whitney Peak Hotel taking residence. 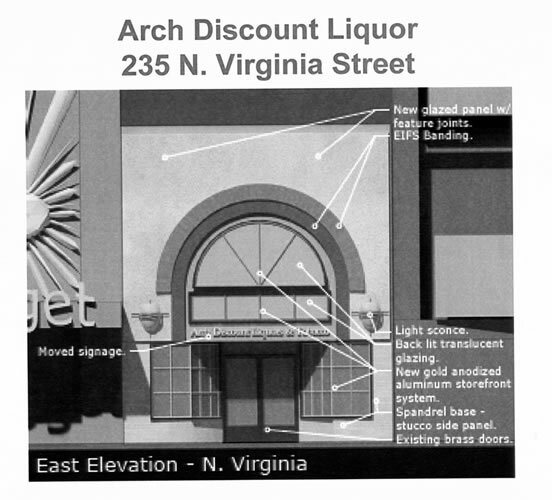 The program only went as far as hiring an architect to draft rendings (shown below) of what the makeover could look like. A combination of budget cuts and differing opinions of the property owners on design, the program never made it past this point. Luckily however, most of the block was ultimate 'made over' between the Knitting Factory, Siri's and Whitney Peak Hotel. 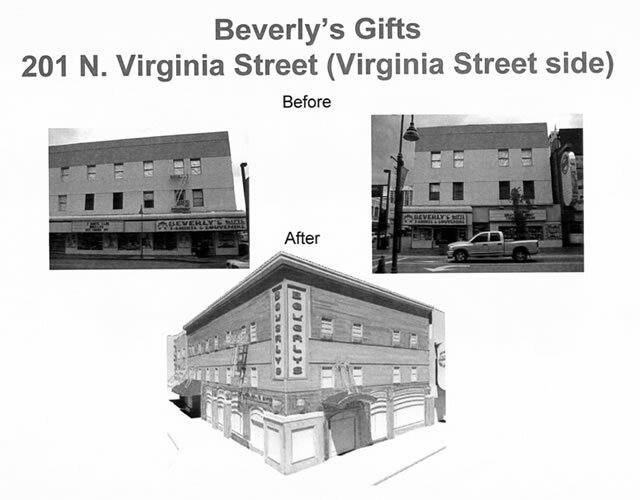 The building that formerly housed Beverly's gifts SERIOUSLY on the corner of Virginia and 2nd Street needs a makeover. 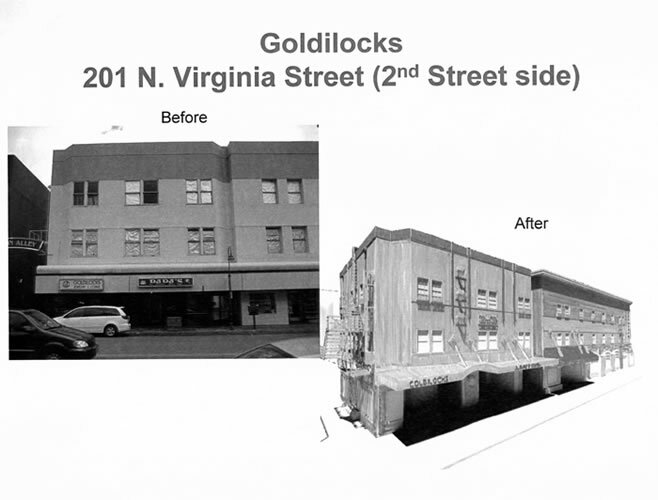 The Façade Improvement Pilot Program encourages owners or business tenants of existing commercial properties to restore, renovate or improve their buildings to be more appealing to the consumer and to the area. The program provides the use of public funds to leverage private investment for improvements to buildings. Participants in the program will be required to work with City Staff and a Design Consultant to ensure that property improvements will be undertaken in accordance with established design guidelines. Staff recommends that the City Council approve this program whose key elements are the provision of an architect to work with property and business owners and the provision of financial assistance in the form of forgivable loans forgivable over five years. The sum of $500,000 was approved for the Façade Improvement Pilot Program. The Redevelopment Agency is proposing to use these funds to make forgivable loans to owners or business tenants of commercial properties. 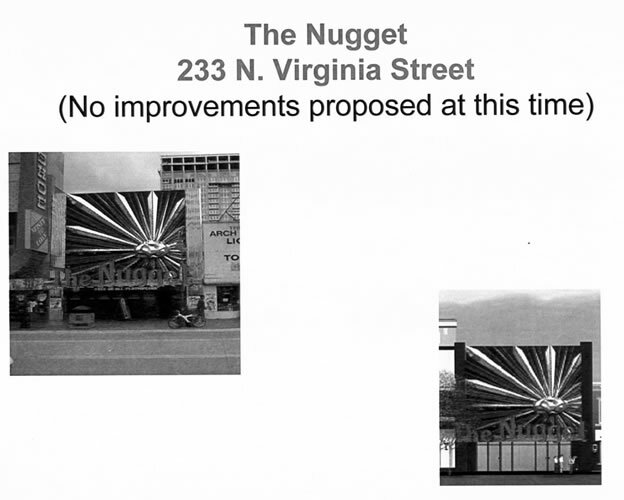 The pilot will be conducted on Virginia Street from Second Street to Douglas Alley. 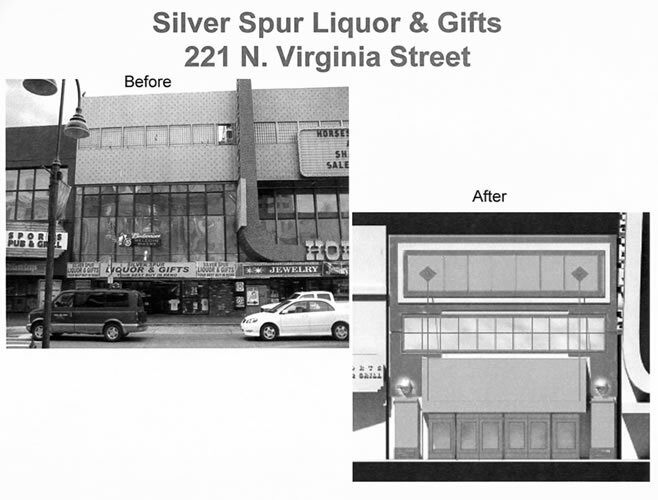 Because of the nature of the property on the corner of Virginia and Second Street, the project will extend west on Second Street to the end of the building. As part of the Façade Improvement Program (FIP) participants will be provided with free architectural services to develop design concepts for exterior improvements. 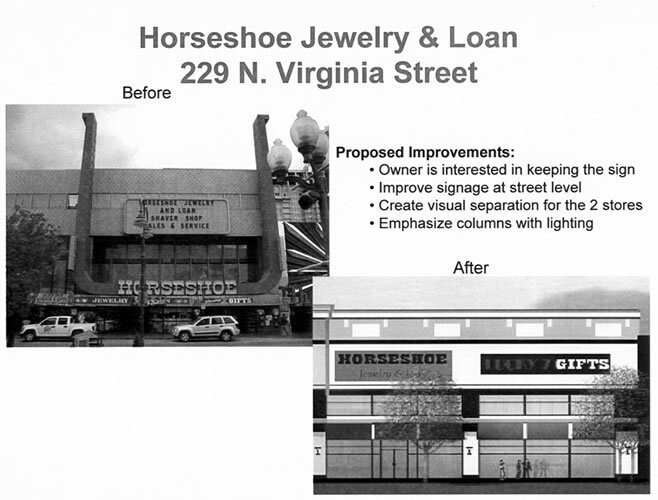 Professional design assistance will be provided to ensure that façade improvements are of a high quality and enhance architecturally and historically significant features of commercial building storefronts. Architectural design services are a key component of the FIP. The City Architect will be a resource for this program and if needed architectural firms will be selected through a Request for Qualifications process. Another key component of the FIP is the funding to participants. The loans will be forgiven in equal amounts annually over a five year period, from the date of the loan closure. 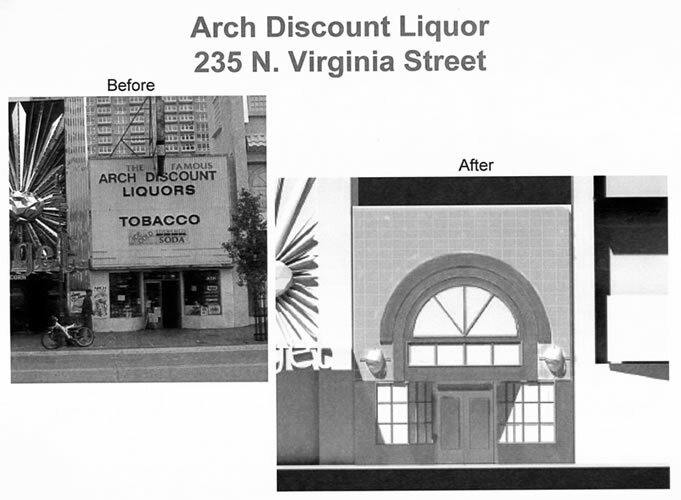 Im hoping this program will inprove the facade of the god awful liquer store in front on the riverwalk tower (2nd st,/west st.). The canopy with the grafiti is pathedic. and someone should point out to the Cal Neva casino owners that those 1965-era outside bulbs use 50% or so more energy and cost than LED lights or modern florescents! What an ugly marquee they hold on to (only god knws why!). Mike, whats up with the web site. There has been no updates with in a week. Are things that busy at work? Why hasnt this site been updated for years now? Did we finally just give up on the dieing down town....? Why are you commenting on a post from 2007? LOL what a dork. 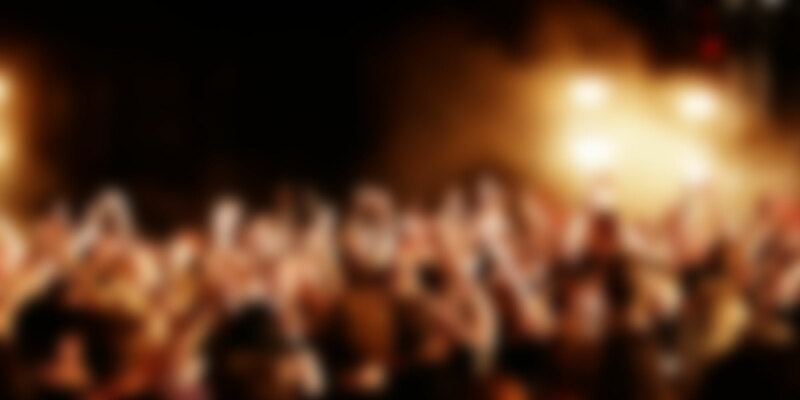 If you bothered to look on his home page, you would notice he posts more often than most bloggers in town. RoFL Though I think he may have a point about the facade improvement plan. 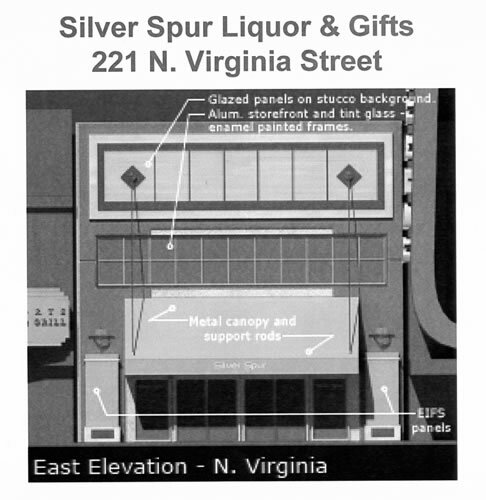 Anyone have any idea on the status of that project (that, and the 10 N. Virginia canopy)? 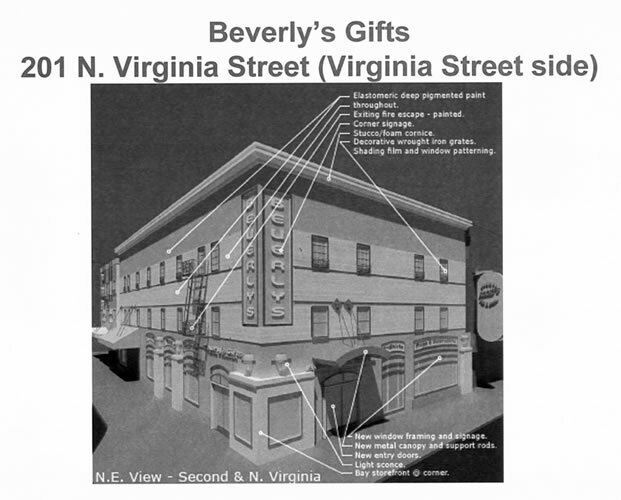 If they held a "Hey lets paint Beverly's Souvenir shop and Horseshoe shop" day downtown and handed all the volunteers a paint brush and can those 2 hideous looking storefronts could be cleaned up in about 4 hours. Golden Phoenix - anybody know what's going on here? They recently removed the particle board from the front of the building, and inside is a row of lit slot machines from one side of the building to the other. Right behind that is a white partition from floor to ceiling so you can't see if anything is happening behind it. The back door in the alley also seems to have been upgraded. A while back somebody applied for a liquor license in this location. Is something happening here, or have they just lit up the front to make the block look more appealing?